If you require privacy or wish to block unsightly views, Ruskins can assist you. 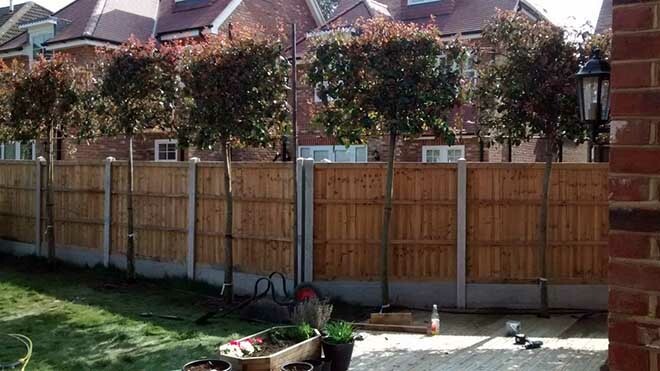 If you require privacy, wish to block unsightly views or perhaps minimise invasive noise, Ruskins can assist you by providing bespoke planting schemes of screening trees up to 12 metres in height. Having discussed your specific requirements we provide a tailored quotation. This will usually contain a number of suitable options with explanations and visual examples. We appreciate that for many clients purchasing large trees is not a familiar process and we will do our utmost to help you feel at ease and confident. Prior to planting we will visit the site to ensure that our recommendations are the most cost effective solution and are in keeping with the site conditions and existing landscape. If space is limited we can select trees which are narrow in form or managed for minimal lateral growth. Pleached trees are a speciality. We plant for many clients evergreen trees for screening. Restricted access issues, given the experience and expertise of the Ruskins team, rarely present a problem. We have a client in Bristol, on an exposed corner plot, for whom firstly we planted a pleached screen along the road boundary and then another screen on the opposite boundary to screen a large conservatory from neighbours. In the now private garden she created a little oasis of tranquility. She has just had a non-invited offer on her house, at a substantial premium to the price she paid 4 years ago. Primarily due to the extension and private garden. The great thing is she is now looking at a house, which is badly overlooked and as such relatively cheap, but she knows what we can do to provide privacy.